The MEGA jacks can be used horizontally when required. Rotatory pump socket. It can be operated from any position. With the same technical features as those of our BR jacks. Designed to suit special applications. The lower height of the BRS jacks facilities easy access to low jacking point. However, the BR2L is used for vehicles with a high jacking point. Other designs of jacks with special technical requirements can be manufactured on request, depending on quantities ordered. We also supply jacks fitted with a pressure gauge always based on a minimum batch. Extension screw provides added lifting height. Safety overload valve. Up to 5t. optional. Safety oil by-pass system prevents the ram from being over extended and causing damage to the cylicnder. Pump handle can be locked. Under demand, a gauge can be adapted to the jack. 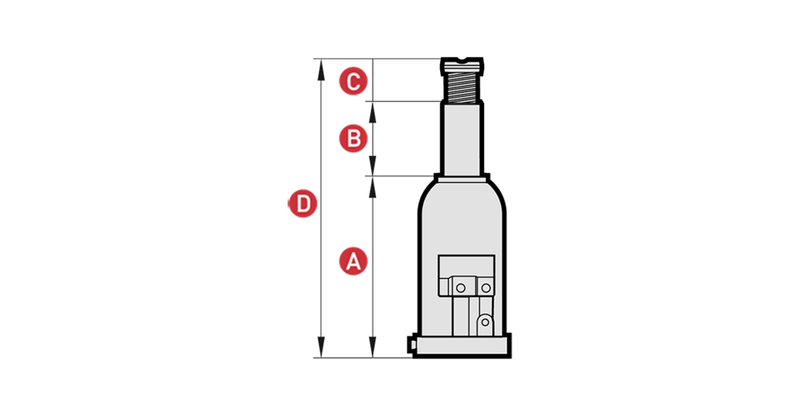 The base, pressure cylinder and oil deposit form one integralpart and provide more strength and safety to the jacks. Any pressure loads produced by the vehicle axle tilting are absorbed as the piston never comes into contact with the cylinder. Therefore the jack will not be damaged even if the vehicle tilts.